Front row (left to right): 1. Joanne Moomau, 2. Rosalie Calitto, 3. Carolyn Yanes, 4. Janice Rego, 5. Susan McLaughlin, 6. unidentified, 7. Cherill Dickey, 8. Karen Kent. Second row: 1. Hollis Grieve, 2. Paul Beebe, 3. Roger Jensen, 4. Jackie Christ, 5. LeeAnn Ray, 6. Mary McLaughlin, 7. Nick Bubnar, 8. unidentified. Third row: 1. Harold Hull, 2. Gerald Vargas, 3. Wayne Armstrong, 4. unidentified, 5. unidentified, 6. unidentified, 7. Jim Street. Fourth row: 1. Glenn Mooney, 2. Ray Fagundes, 3. unidentified, 4. unidentified, 5. unidentified, 6. unidentified, 7. Rudy Martinez, 8. unidentified, 9. unidentified teacher. Credits: From the collection of Jim Street. Scanned by Jim Street. Thanks to Jim Street for identifying the kids in this picture. 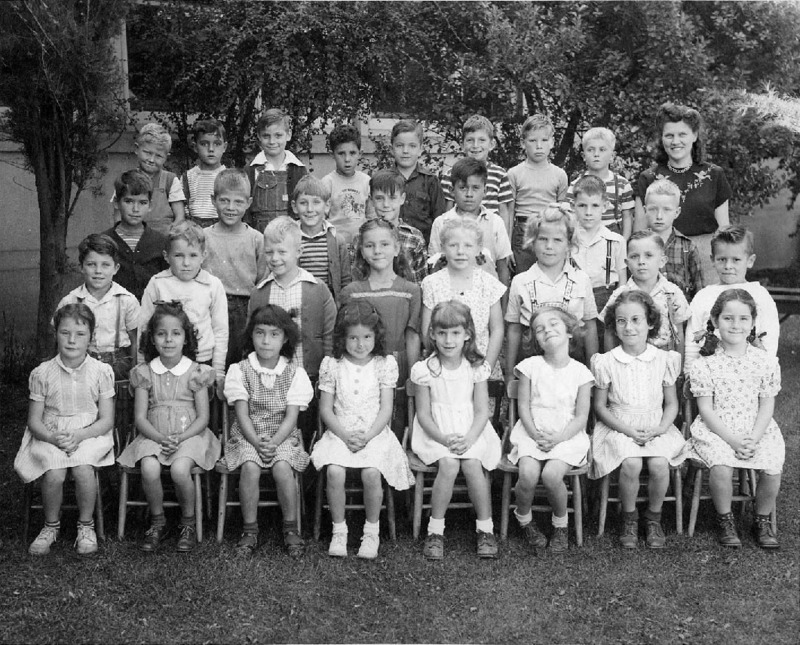 To find other pictures from Livermore Elementary School (now kown as Fifth Street School) in the archive, see Livermore class pictures listed by school: Fifth Street School. And if you have any pictures from Livermore Elementary School that you would like to share, please submit them to the Archive.